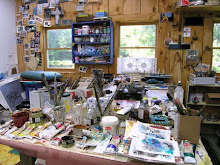 Milisa (called Misa) Galazzi, a member of New England Wax, is exhibiting her work at Springfield College in Springfield, MA.. 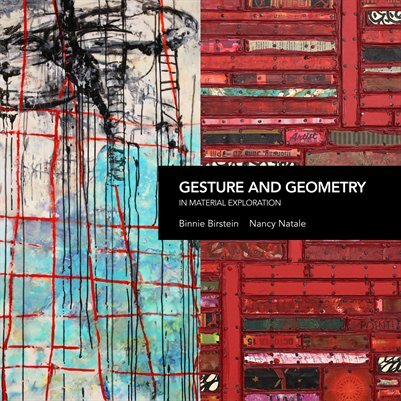 I was pleased to attend the opening reception and to hear Misa give a gallery talk. 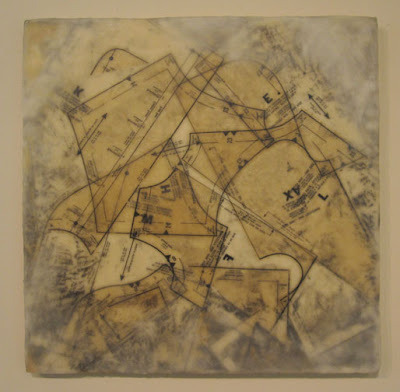 The show includes encaustic but is much more about the use of thread and other fibers in the traditionally female pursuits of making clothing, stitching embroidery and sewing lace. 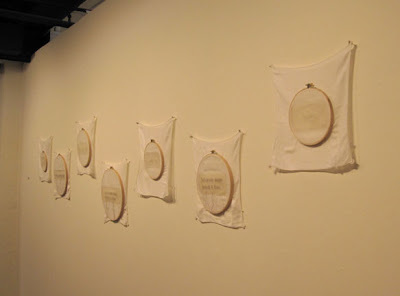 The "thread" of the exhibition title also refers to invisible threads tying together human communication and relationships that connect women to their families, friends and to each other over the long course of time. 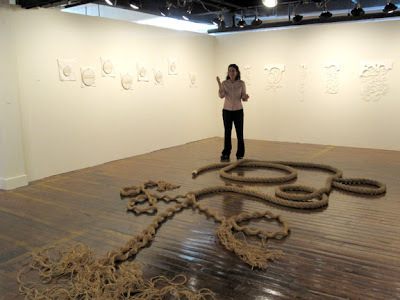 Misa giving a gallery talk. 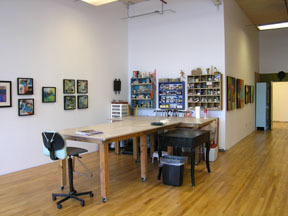 Foreground: "The Bitter End" (rope piece), left wall: "She Called Me Every Sunday", right wall: "Hand Sewn Doodle Lace." 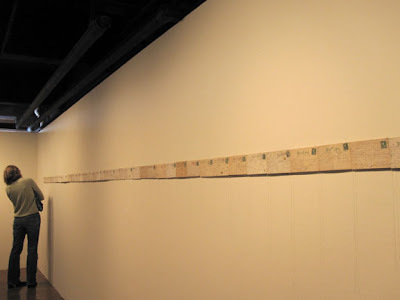 The show provides evidence of Misa's strong connection to family in her use of sewing patterns inherited from her aunt, embroidery hoops with embroidered and waxed text messages that recap childhood conversations with her grandmother about handwork and women's duties, a long wall full of early 20th century postcards from her grandmother's collection that document written communication and connections between children and their relatives. 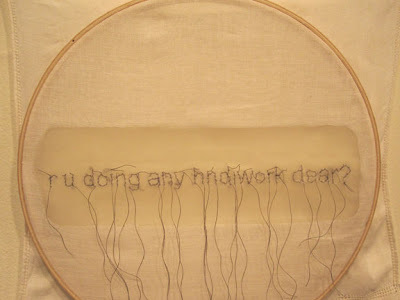 The postcards and embroidery hoops reminded Misa of the ongoing texting communication between herself and her teen-aged son. "Texting Through Time". 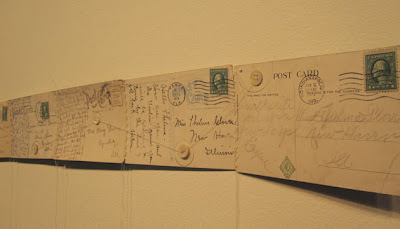 Misa has sewn antique postcards together with old bone buttons and left threads dangling where the cards are joined. An embroidery hoop from "She Called Me Every Sunday" with the question her grandmother asked her each week when they spoke on the phone. The question is "translated" into text-speak. The text is embroidered on an antique handkerchief and then waxed. 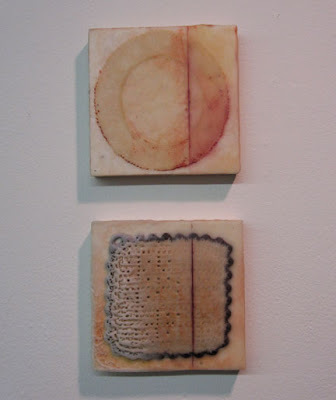 An encaustic dipytych titled "Nonna and Nonno" (Grandmother and Grandfather). 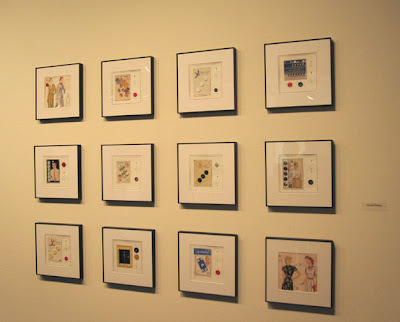 "Visual Poems" A wall of framed button cards and buttons with a nostalgic look. 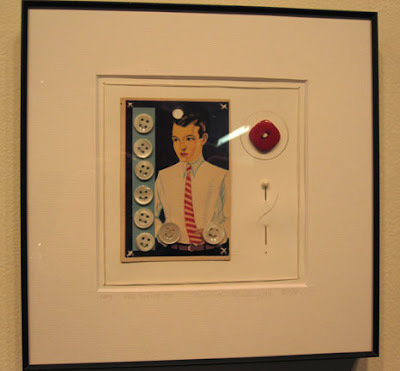 Misa finds the buttons at yard sales or antique stores and many of them are sent to her by her collectors of this work. Closeup of an individual work in "Visual Poems" - shirt buttons on a card showing the well-dressed man of the time. In a smaller gallery, Misa installed an airy forest of dress patterns, hung from the ceiling on fishing line, that moved in the air currents as viewers walked through them. 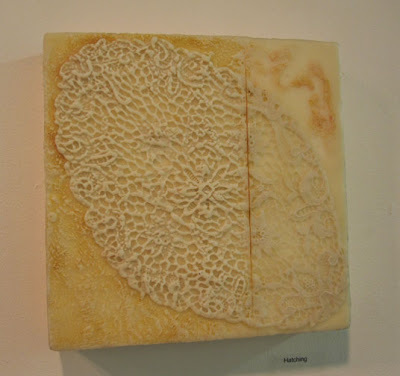 The idea was to take viewers through the layers of patterns used in creating the encaustic painting below. 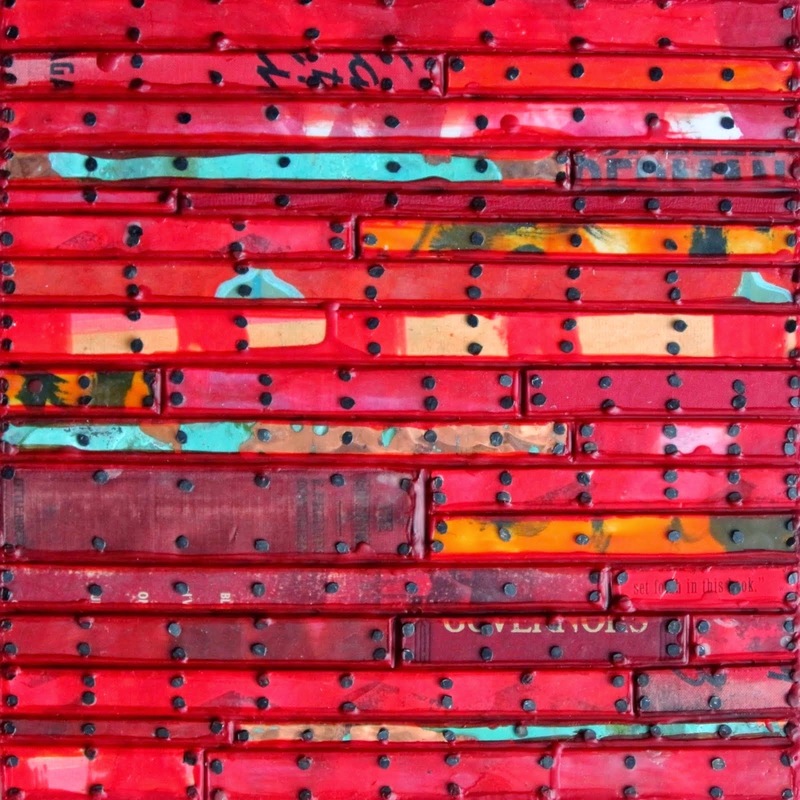 "Layers of Time", encaustic and dress patterns. 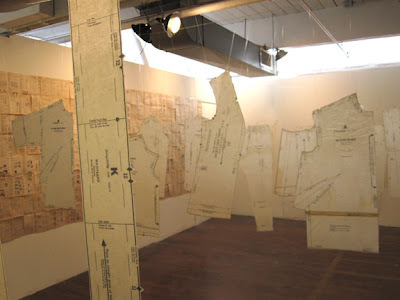 The dress pattern installation, "Layers of Time." 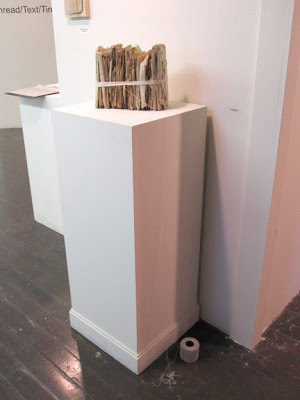 "Protecting," bound dress patterns with roll of crochet thread at the entry to the larger gallery. This was a unified and well-considered exhibition that poetically brought together many aspects of work traditionally performed by women, including that of holding families and society together. Misa's gallery talk explained her work in clear language that touched on her inspiration for the work and methods of carrying it out. 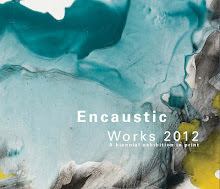 The exhibition continues until April 2nd. Thanks for this marvelous post! Wow! Thanks for this. Beautiful and thoughtful work. Thank you, Gloria and Gwen. I'm glad you enjoyed reading about Misa's show. 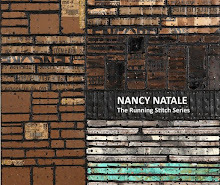 Nancy thanks for the update on Misa's show! The work is very nostalgic. Also, congrats on your interview on Terry Dimond's blog! Well deserved and a nice write up and photos.